Franchise owner of Golf Experience Caribbean, Zorol Barthley, expressed delight at being able to expand the International Pairs brand to St Kitts and throughout the Caribbean, and sees it as a part of the “big picture” of positioning the Caribbean to host the International Pairs World Finals in the not too distant future. St Kitts/Nevis will be represented by Dave Ramsumair and Harry Harridyal at the 2015 International Pairs World Finals in Denia, Spain from October 27-31. 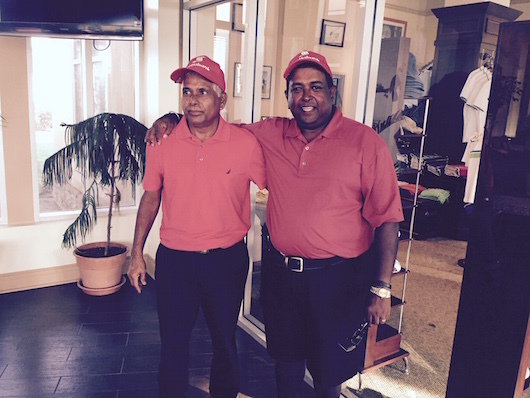 The pair won the International Pairs qualifying event yesterday, at the picturesque Royal St. Kitts Golf Club by scoring 45 stableford points, and in the process staving off a challenge from brothers Zeke and Raymond Percival. In a hard fought contest, one point separated the top three teams, with the Percival brothers edging ahead of Adrian Norford and Juan Castilllo courtesy of a count back of the last nine holes. Ramsumair and Harridyal has earned themselves an all expenses paid trip to represent St Kitts/Nevis at the International Pairs World Finals in Denia, Spain from October 27-31, and joins the Trinidad & Tobago pair of Haydn Imam and Monty Chapman as the Caribbean’s representatives to have advanced so far in the regionally hosted qualifiers. The St Kitts qualifier was presented by the St Kitts Tourism Authority, and whilst making the presentations to the winners, Minister of Tourism, the Honourable Lindsay Grant outlined that opportunities of this type fits in with his Government’s thrust to establish the Federation as a major golfing destination. “With two established world class golf courses already in operation, and another two coming on stream shortly, opportunities of this type for local golfers will only enhance the Federation’s footprint as a major golfing destination”, the Minister positioned. The final qualifier in the Caribbean series will be hosted at the Cedar Valley Golf Course in Antigua on Saturday, when local golfers will compete in the Sandals Resorts sponsored event to choose that country’s representatives to the World Finals. The Caribbean was first represented at the World Finals in 2009.
International Pairs was established by a group of friends in the United Kingdom to celebrate the start of the Millennium, and attracts in excess of thirty teams from all over the world.